Origin Almond announces new distribution with La Colombe Coffee Roasters to offer a new line of plant-based & low-sugar drinks in select Philadelphia cafes. 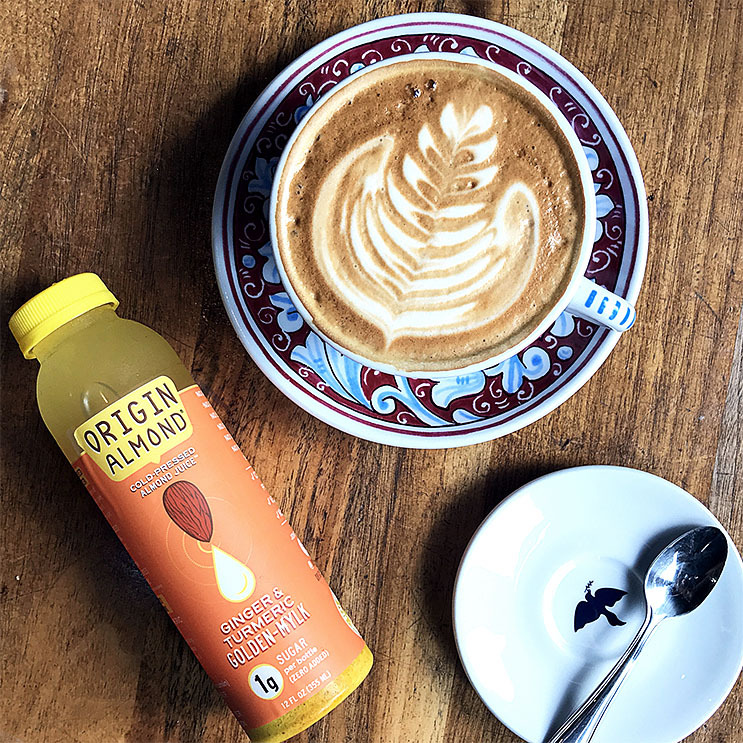 Some La Colombe Cafes in Philadelphia will sell Origin Almond, which are a line of cold-pressed almond juice beverages. 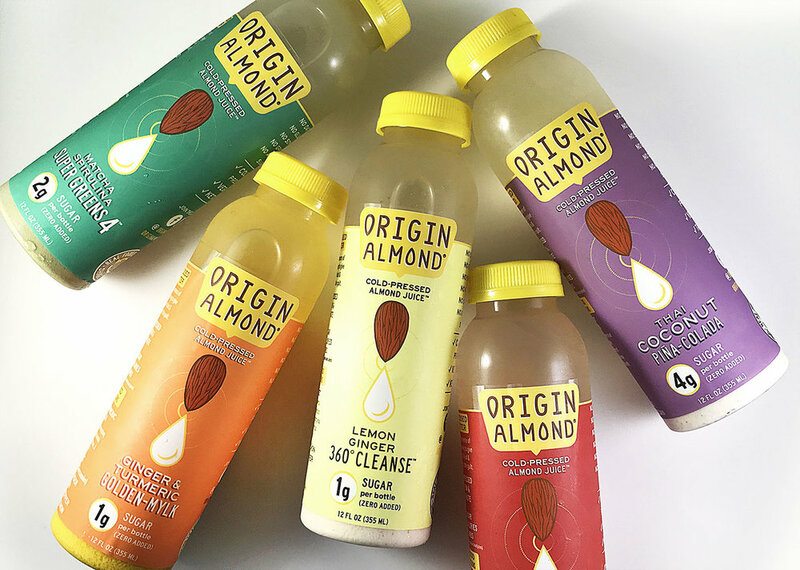 Most of the Origin Almond beverages contain just 1g of sugar per entire bottle, and they are made with a base of cold-pressed organic almonds. The almond juices are also infused with plant-powered super foods and adaptogens, and the current flavor offerings include Lemon Ginger 360 Cleanse, Thai Coconut Pina Colada, Ginger Turmeric Golden-Mylk, Matcha Spirulina Super Greens 4, and more. The Almond Juices are available at two La Colombe stores in Philadelphia starting August 19th. PHILADELPHIA—Origin Almond & La Colombe Coffee Roasters, two Philly-based beverage innovators, are teaming up to offer Origin Almond’s new range of cold-pressed almond juices in select La Colombe cafes in Philadelphia starting mid-August. Beginning August 20th, La Colombe’s Fishtown and Independence Mall cafes will be making Origin Almond available to customers in their grab-and-go refrigerators. Ginger & Turmeric Golden-Mylk—The Rejuvenating Elixir. Ancient healing spices helps to promote anti-inflammatory, immune, & digestive health. Thai Coconut Pina Colada—Guilt free tropical indulgence with health & brain-boosting MCTs (good fats!). Lemon Ginger 360 Cleanse—The 1st complete low-sugar cleanse that purifies and keeps you refreshed and strong. Matcha Spirulina Super Greens 4—Daily burst of vital green health powered by super greens sourced from the Earth & Ocean. Iced Lemon Chai Spice—Delicious spicy comfort with our aromatic Masala Chai Spice blend that’s topped off with refreshing squeeze of lemon. Lemon Charcoal Dark Detox—Activated charcoal pairs with classic lemon & ginger for a deliciously refreshing daily detox. In addition to those select La Colombe locations, people can also find Origin Almond at Wholefoods Market stores and other healthy-minded locations in the Greater Philadelphia and South/Central NJ area. See the full list of stores at OriginAlmond.com. Origin Almond (www.OriginAlmond) is a purveyor of premium, plant-based beverages based on organic, sprouted almonds. All their deliciously wholesome products are naturally low-sugar & free from gluten, dairy, soy & grain-free with zero additives and most are Keto approved. The company has also innovated on sustainability with the launch of Clean as Kale (www.CleanAsKale.com) a separate skincare line that uses the Origin Almond by-product as a primary component. They’re proudly local with all products handcrafted in South Jersey since 2015.